Fascinatingly disturbing, this memoir chronicles seven years in the life of a distinctly unordinary American family. 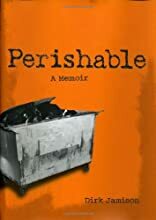 In 1973, Dirk Jamison's father started having a midlife crisis that never ended, and after purposefully losing his construction job, he moved his family to a ski resort and started feeding them from dumpsters in an effort to reject money and all its trappings. They were never homeless, never desperately poor, but they lived on garbage. While Jamison struggled with adolescence, he faced a father who valued freedom more than anything, an overweight Mormon mother, and a cruel sister who delighted in physical abuse. Hilarious and horrifying, this heartbreaking account tells the strange story of the anti-American dream. About Dirk Jamison (Author) : Dirk Jamison is a published author. A published credit of Dirk Jamison is Perishable: A Memoir.